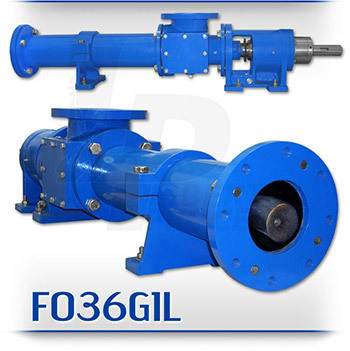 The F036G1L Progressive Cavity Pump is designed for high viscosity liquids and heavy waste solids such as heavy crude oils, oil sludge transfer and thickened waste oils in refineries and tanker operations and as a standard crude olil sludge pump. The F036G1L’s low shear and gentle pumping action make it ideal for pumping and transfer applications while the solids handling capability of up to 50% by weight allows even the thickest sludge’ to be pumped. The F036G1L’s flow rate of 36 gallons/100 revolutions @ 100 to 162 GPM coupled to its high temperature resistance of up to 350° degrees Fahrenheit makes it an ideal solution for your heavy-duty pumping needs. The F036G1L is a standard ANSI flanged pump design manufactured with high strength cast Iron or 316 Stainless Steel pump casings and designed in 1, 2 and up to 4 stages for 85, 170, and 350 psi discharge pressures making it an ideal low-cost, maintenance free drop-in replacement pump. Standard suction and discharge flange size for the F036G1L is 6″.